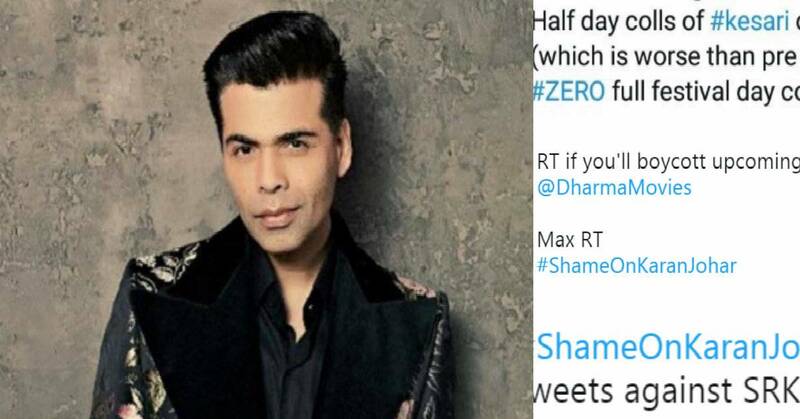 #ShameOnKaranJohar Starts Trending On Twitter After Karan Johar Likes A Negative Tweet Bashing Shah Rukh Khan! This did not go down well with Shah Rukh Khan fans and soon they started trending #ShameOnKaranJohar on twitter. Since then the fans are criticizing Karan Johar for the action and the hashtag also trended on the fifth season. However KJo soon unliked the tweet after realizing his mistake. Given that Shah Rukh Khan and Karan Johar are good friends, this inevitably didn't go down well with SRK fans. The Akshay Kumar starrer Kesari opened to an impressive box office collections at the box office. Wherein the SRK starrer Zero failed to work wonders at the box office. Here are some of the reactions to KJo liking the tweet.